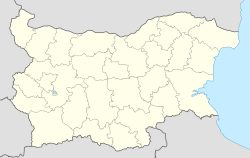 Kaolinovo (Bulgarian: Каолиново, pronounced [kə.uˈlinuvu]) is a town in northeastern Bulgaria, part of Shumen Province. It is the administrative centre of the homonymous Kaolinovo Municipality, which lies in the northern part of Shumen Province. As of December 2009, the town has a population of 1,538 inhabitants. Kaolinovo was named after its main product: the municipality is rich in high-quality kaolin (china clay), with a mine and an ore dressing plant present. The reserves amount to 65 million tonnes. This Shumen Province, Bulgaria location article is a stub. You can help Wikipedia by expanding it. This page was last edited on 2 May 2017, at 05:10 (UTC).